It is colourless silane-siloxane silicon based water repellent coating for exterior walls plastered, exposed bricks, RCC/Stone facial, Old Heritage lime-finished Structure. It allows the masonry to breathe. Available in water & solvent based grade. We as well our company is one of the leading service provider of water repellent finish. Backed by a diligent team of professionals, we have been able to offer Solvent Based Water Repellent that offers protection of mortar surfaces from the attack of salts and acids, the offered water repellent is precisely processed using premium quality ingredients and advance technology in accordance with quality standards. We are at our place one of the well known service provider of Water repellent finish/ coating. Our company is offering Water repellent finishing/ coating services. Protect Guard Top Coat is a colourless anti-stain protection for vertical painted substrates. Protect Guard Top Coat helps fight the natural aging of acrylic paint, and prevents powdering, degradation, blistering and flaking. Tuff Repell is excellent water repellent for external use with improved self cleaning properties. Dosage /Coverage 7m2 - 9m2 per liter. Use: It protects formation of algae, fungus and dampness and acts as raincoat for exterior surface. Ideal for exposed brick work, stone work, concrete blocks, coating over paint, etc. Hydroreple 290 is an oligomeric organosliane unique liquid to form stable water repellent. Hydroreple 290 is low viscosity liquid with an optimum concentration of reactive hydrophobic silane-siloxane in solvent carrier. Hydroreple 290 works by impregnating into pores, voids, capillaries and cracks of masonry and concrete forming excellent hydrophobicity on the surface. We are providing Water repellent finishing/ coating services. 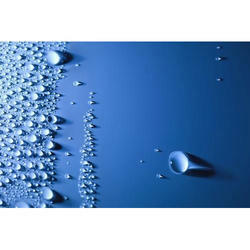 We are one of the leading supplier of Water Repellent Finish. Because of global warming the distribution of mosquitoes has expanded from tropical regions to northern latitudes, and that leads to a spread in sources of viral infection from mosquitoes. Daiwa Chemical was the first in Japan to introduce a mosquito repellent for textiles which repels mosquitoes. Water repellant coating service / Water Repellent Finish.